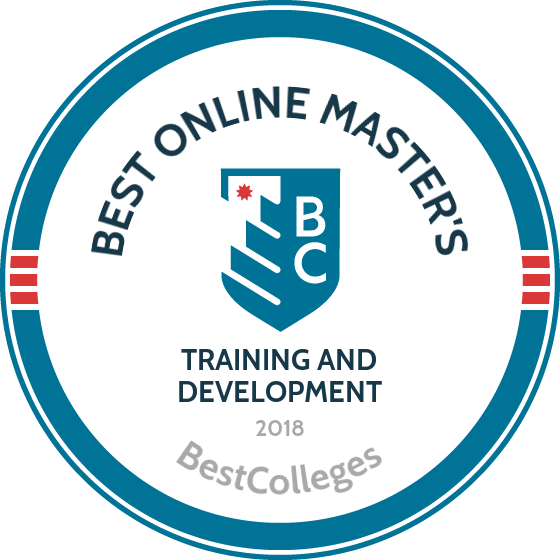 What Are The Best Online Master's in Training and Development Programs? What Else Can I Expect From an Online Master's in Training & Development Program? An online master's degree in training and development equips graduates with the communication and leadership skills needed to work for the human resource and corporate education arms of various industries. Training and development specialists assess a company's goals and current performance to create training programs that improve employee competence and effectiveness. Programs vary in length depending on proposed outcomes, and they may occur in a classroom setting or in a hands-on work environment. However, they usually emphasize collaboration, team building, and the integration of technology as part of daily best practices. The U.S. Bureau of Labor Statistics cites expansion in training and development field with 11% and 10% job growth rates for specialist and management positions respectively between 2016 and 2026. In addition to careers in private businesses and corporations, professionals may pursue careers in school settings as teachers, counselors, and curriculum designers. Using the academic and career information found in this guide, you can find the online training and development master's degree program that works best for you. N.C. State’s master of education in training and development is a good fit for working professionals seeking a part-time graduate degree. The curriculum encourages students to integrate their real-world experiences with human resource development applications. Courses are based on principles of adult learning emphasizing collaboration, team learning, and interaction. Graduates are prepared for entry-level employment or advancement in instructional design and administrative, evaluation, and instructional positions grounded in performance-based principles and practice. Students in this master’s degree in training and development are required to complete 36 credits of coursework. Except for a culminating capstone portfolio course, classes may be completed in any order and require no prerequisites. Most students take one or two courses each semester, completing all requirements for graduation in two to three years. The program is delivered through the Moodle learning management system and the Blackboard Collaborate two-way conferencing tool. Most courses are offered asynchronously but some may require synchronous attendance for class or small group meetings. NC State does not require the GRE or GMAT for admission. Founded in 1841, Villanova is a Catholic university with an enrollment of more than 10,000 undergraduate, graduate, and law students. Its master of science in human resource development provides a foundation in core human resource competencies with coursework in organizational change, organizational training, compensation, international HR, and project management. Villanova’s online degrees consist of six eight-week terms. Admission is ongoing throughout the academic year, and the GRE or GMAT are not required for acceptance into the graduate programs. This 36-credit master’s degree in training and development requires 12 courses including a capstone experience. The flexible, entirely asynchronous online format enables students to graduate in two years. Applicants with one-plus years of work experience in HR can apply for a waiver of up to six credit hours. Students in this program are prepared to pursue professional certification examinations administered by the Society for Human Resource Management (SHRM) or the Human Resources Certification Institute. Webster was founded in 1915 in Saint Louis and boasts a current enrollment of 17,000, including distance learners. Webster’s master of art in human resources development fits the needs of human resources professionals seeking career advancement in addition to learners interested in entry-level HR positions. The training and skills emphasized in the curriculum are applicable to human resources development settings, including corporate offices, HR development consulting firms, and boutique training firms. This training and development master’s degree requires 36 credits, including 24 hours of core courses in human resources development, organizational change, and research and assessment methods. The program is offered asynchronously without set days or times to log in and no on-campus meetings. Courses are offered through Webster’s WorldClassRoom portal for online learning, using the Canvas learning management system. Webster considers applications for admission on a rolling deadline, but applicants should apply a semester before they wish to enroll. Clemson is a public research institution recognized for its science and technology programs. Its master of human resource development is particularly beneficial for working professionals in human resource fields who seek career advancement. The degree is structured to reflect best practices and competencies for training and development practitioners identified by the International Society for Performance Improvement. The multidisciplinary curriculum draws from psychology, sociology, education, organizational development, management, and systems design. Coursework stresses leadership, cultural diversity, ethics, and applied research. An optional program emphasis is available in athletic leadership. Clemson’s training and development master’s degree requires 36 credits and is offered completely online through AdobeConnect and Blackboard delivery systems. Students are encouraged to enroll in two courses per semester, with those beginning in the fall term expected to finish in two years. The GRE is a requirement for admissions, but applicants with three-plus years of work experience in HR development may request a waiver. Amberton is a nondenominational Christian university focusing exclusively on the needs of mature adults with employment experience who have already completed some coursework at an accredited institution. As one of the schools named to the Military Friendly School list, it offers course credit to active or former members of the armed forces for their military experience. Amberton’s master of science in human resources training and development requires 36 credits. Courses are delivered asynchronously with no on-campus attendance. This training and development master’s degree prepares graduates to move into leadership roles in public and private settings in human resources, training and development, consulting, team development, and recruiting and staffing. The curriculum features coursework in ethics and decision-making strategies and emphasizes the practical skills needed for HR training and development positions. This includes the assessment of development needs for specific work environments, the design and implementation of training programs, and the implementation of evaluation methodologies and systems. Established in 1971 as part of the University of Texas system, the UT Tyler offers bachelor's and graduate degrees. Over 10,000 students are enrolled in its on-campus and online programs. UT Tyler’s fully online master of science in human resource development provides specific skills needed for employment in training and development, including needs assessment, organizational and human resource development tools, and the design, delivery, and evaluation of training programs. The 36-credit master’s degree in training and development requires a six-hour core in the foundations of HR development and research methods. In addition to the focus on practical skills like measurement, evaluation, and performance, the curriculum offers HR management, leadership and ethics, adult learning theory, and conflict resolution courses. The GMAT is a requirement for admission to the degree program, but this may be waived for applicants with three-plus years of supervisory or managerial work experience. DBU is a comprehensive Christian institution established in Texas in 1898. It has offered online education since 1998. The master of arts in professional development is one of 75-plus completely online degree programs offered by DBU. This 30 credit-hour training and development master’s degree is tailored to the needs of working professionals. The curriculum offers students two options -- a multidisciplinary track or a single track from one of the following concentrations: business, criminal justice, higher education, counseling, leadership, English as a second language, missions, professional life coaching, or training and development. Students in both tracks must complete six hours of core courses comprised of one class in leadership studies and a seminar on worldviews and belief systems. DBU does not require the GRE for admission to the graduate program. Applicants must have a bachelor’s degree from a regionally accredited school with a 3.0 minimum GPA, and must submit two letters of recommendation and a current professional resume. North Texas boasts an enrollment of 38,000-plus students from all over the world. UNT offers 20-plus graduate degrees, five bachelor’s completion degrees, and several certificates at the graduate and undergraduate level. UNT’s master of science in workforce learning and performance is a multidisciplinary program preparing students for supervisory roles in training and development and technical education positions. This 36-credit online master’s degree in training and development is offered in eight-week course formats with five start dates throughout the academic year. Coursework stresses practical applications in applied technology, needs analysis, and evaluation and accountability. Students also benefit from the curriculum's focus on interpersonal skills and diversity issues in the workplace. A course in educational statistics and two capstone seminars are required. A master's thesis is optional but a comprehensive research project within a student’s field of specialization is a requirement for graduation. LSU’s master of science in human resource education offers a concentration in human resource and leadership development in an accelerated online format. The 36-credit program consists of 12 courses offered in seven-week sessions, and can be completed in one year. This master's degree in training and development is designed for working professionals with three-plus years of experience who are interested in moving into leadership roles in human resource education. The curriculum is built on a core set of courses in HR foundations, data analysis, and methodology, with a strong emphasis on practical applications in training and development, and in performance and needs analysis. Electives include instructional design, workforce development, and organizational leadership. Applicants without professional work experience must submit GMAT or GRE test scores. Founded in 1910, Southern Mississippi is a research institution with an enrollment of 15,000-plus and is one of seven schools in the state offering online degrees. The master of science in human capital development is designed to fit the needs of working professionals. Available in two formats, the degree can be completed in 12 to 24 months. The fully online degree format is delivered asynchronously with no required on-campus meetings. Courses in this online option are taught in eight-week blocks through the Canvas learning management system. The executive format program option combines online instruction with face-to-face classes. The curriculum teaches students to design and implement interventions and training programs improving workplace performance and learning. The teaching and development master's degree requires 33 hours including a mastery project and comprehensive exam completed during the student’s final term. Applicants to the training and development master’s program must submit GRE or GMAT scores for admission. National Louis University offers seven online degree programs. The online master of science in human resource management and development is tailored for working adults seeking to advance from a line or support role to a managerial or leadership position or for those interested in changing careers. Students may graduate in as few as 20 months. The cohort-based format allows students to progress through the program with the same set of classmates. A blended option, mixing online courses with face-to-face meetings, is also available. Human resource practitioners who have acquired certain HR certifications may be eligible for prior learning credit to shorten the amount of time needed to finish the degree. The training and development master’s degree requires 36 credits, including a capstone course taken in the final term before graduation. Coursework combines theory and practical applications with an emphasis on diversity and inclusion in the workplace and employment law and regulations. Lewis is a Catholic institution serving 7,000-plus traditional students and adult learners, and offers undergraduate and graduate programs in numerous locations and formats, including five online master’s degrees. The training and development concentration in the online master of arts in organizational leadership provides students with practical applications and techniques they need to develop training programs, improve job performance, and increase productivity for an increasingly diverse workforce. The online training and development master’s degree is delivered in an entirely asynchronous format with no on-campus attendance required. The courses are scheduled in eight-week formats and the degree can be completed in 18 months to two years. The program requires 36 credit hours of eight core courses, four courses in the concentration, and a culminating capstone experience. Coursework in the concentration focuses on team building, mentoring and coaching, organizational cultures and systems, and training design and delivery. Pittsburg State is located in the southeast corner of Kansas and serves 7,400-plus students in over 1,000 academic programs with several fully online options. The online master of science in human resource development prepares graduates for careers in human resources, organizational development, and employee training. Applicants to this training and development master’s degree program must have an undergraduate degree in human resources, business, education, or a related field of study. The 34 credit-hour degree offers two emphases. The first is designed for students interested in careers in human resource development management or consulting. The second focuses on human resource program development and delivery. In addition to coursework, students must complete either a master’s thesis or a comprehensive final examination to graduate. The curriculum is aligned with the recommendations developed by the SHRM. Courses successfully completed in the master’s program can be applied as acquired knowledge for the SHRM Certified Professional exam. Memphis offers a master of professional studies with a concentration in training and development through its University College, designed to provide interdisciplinary degree opportunities to working professionals. Students are encouraged to customize their degree plans and may also earn credits for professional work experience. This master’s degree in training and development prepares graduates for leadership roles in the delivery, assessment, and management of on-site or distance training programs in many work settings. The curriculum provides the knowledge and skills needed by working professionals for career advancement, emphasizing practical applications in organizational assessment, e-learning technologies, and the design and implementation of training materials. The 33-credit degree program is delivered entirely asynchronously. The curriculum requires nine credits in professional ethics, globalization, and research methods; six credits of electives, and a three-credit culminating capstone course. The concentration requirements make up the remaining 15 credits, including classes in statistics, instructional design, evaluation, and needs analysis. Tennessee Tech offers over 40 undergraduate and 20 graduate degrees to a student body of 10,000-plus. TTU’s online master of professional studies with a training and development concentration offers a flexible format to fit the needs of working adults seeking to move into managerial and leadership careers in the growing fields of workplace learning and performance. Courses are delivered asynchronously and are accessible at any time. This master’s degree in training and development teaches students how to manage, deliver, and assess on-site training programs and how to incorporate technology into workforce education. Coursework addresses theoretical foundations and practical applications in adult learning and cognition, needs analysis, instructional design, project planning, and delivery and evaluation in traditional and virtual environments. The 33-credit degree consists of three foundational courses, five courses in the training and development concentration, two specialized electives, and a professional research project completed in the final semester that incorporates knowledge and skills gained throughout the program. In order to offer accredited master's degree in training and development programs, colleges and universities must adhere to rigorous academic standards, including similar core degree requirements. However, advanced classes and capstone experiences vary greatly between programs, particularly if one specializes in a particular sub-field like curriculum development and educational training. Prospective students should research schools carefully to ensure they find the degree track that best fits their professional goals. The Adult Learner: In this course, students analyze the psychological and sociological theories related to adult learning, with an emphasis on their applications to instructional development and delivery. Topics include diversity in characteristics and backgrounds, motivation, and learning processes among learners in different educational contexts. This class covers topics that provide a foundation for all future training and development specialists. Ethics in Decision Making: Students learn the essential theories behind values-based leadership by analyzing case studies that differentiate difficult choices from genuine ethical dilemmas. The course also focuses on developing a student's ability to communicate effectively and facilitate productive discussions among groups of diverse individuals. All training and development professionals, especially those hoping to work in the business sector, must complete this class. Strategic Workforce Planning: In this class, students use strategic workforce planning (SWP) strategies to support organizational goals through an integrated talent management system. The course covers topics such as SWP models, components, processes, and the implementation and evaluation of successful training programs. Integrating Technology into Training Program: Students in this course learn how to select the appropriate technologies for training scenarios with consideration to specific outcomes, adult learner needs, and organizational and training resources. Additional topics include multimedia platforms, computer-based tools, and performance-relevant training models for distance learning and classroom education. As technological tools become more common in academia, this course will continue to become more valuable. Consultation for Education and Industry: This course prepares students to work in training and development firms or as freelance consultants. Topics include client situational assessment, the dynamics of professional relationships, and evaluation of consultation programs. The course also emphasizes general theories of human resource development for both internal and external practices. How Long Does It Take to Get an Online Master's in Training & Development? Similar to other graduate business programs, online master's degrees in training and development usually include 30 to 36 credits of coursework. Students usually graduate within two years, though this may change depending upon the structure of a particular program. For example, while most distance education programs rely on asynchronous coursework, some schools require synchronous classes to foster relationships between students and faculty. Likewise, some institutions eschew individually-paced study for a cohort learning style that requires students to progress through the program concurrently with a small group of classmates. This means students usually complete one course at a time, which can be an attractive option for part-time students and other adult learners who want to continue to work while they earn their degree. Since graduate programs usually contain practicums and capstones, prospective students should also try to find a school that allows them to fulfill these requirements near their home or with their current employer. Society for Human Resource Management Certifications: As the leading professional organization for training and development specialists, SHRM offers standard and senior professional certifications. Both exams test candidates in eight behavioral competencies and 15 human resource knowledge areas. Test structure consists of multiple-choice questions and a four-hour exam period. SHRM-certified professionals need to recertify every three years. Human Resource Certification Institute Certifications: HRCI offers eight certificates for training and development specialists. Candidates pick from exams based on geographic categories and degree levels. HRCI exams consist of multiple-choice, fill in the blank, drag and drop, and scenario response questions. Fees range from $400 to $595 and candidates can take the exam at locations all over the world. To secure national and regional accreditation for their master's degree in training and development programs, schools must align with designated institutional goals and academic outcomes. National accreditation refers to official recognition from the U.S. Department of Education (ED) and the Council for Higher Education Accreditation (CHEA). Colleges and universities earn regional accreditation from one of six organizations, depending on their location, in exchange for meeting state educational standards. For example, an institution of higher education in Texas receives regional accreditation from the Southern Association of Colleges and Schools. Some professional certification programs only recognize degrees regionally-accredited schools. Online training and development master's programs may also enjoy field-specific accreditation from organizations like the Society for Human Resource Management and the Human Resource Certification Institute. ED and CHEA bestow national accreditation and indirectly support regional accreditation through partner organizations. Functioning as a government agency, ED maintains federal academic regulations by rewarding cooperating schools with financial incentives, like student grants and loans. CHEA boasts more than 3,000 member institutions and stands as the premier private nonprofit academic organization in the U.S. The organization advocates for its members through research and policy initiatives. CHEA also enforces standardization among its cohort. For additional information on nationally accredited online master's degree in training and development programs, visit the ED and CHEA websites. The following table uses information from Payscale to detail the salary information of five popular career for professionals who hold training and development master's degrees. In general, pay is commensurate with work experience and rewards skills and relationships cultivated in the field. However, the following data does not account for salary differences caused by location, employer, sub-field, postgraduate education, and optional certification/licensure earned by individual professionals. Additionally, many human resource professionals pursue leadership positions later on in their careers, which usually leads to substantial salary growth. Online master's degree in training and development programs prepare graduates to pursue positions as organizational leaders and educators. These professionals enhance the performance of individuals by providing counseling and cooperative training programs designed for the specific structures and goals of their corporate clients. Training and development specialists possess exceptional creative problem solving and analytical skills, as well as the ability to communicate and instruct effectively. While some trainers work as self-employed counselors and contractors, many of those in training and development work in teams for a single consultancy firm or business. Working in a company's human resources department, compensation specialists oversee employee classification and related benefits, including salary and retirement plans. They also assess an organization's benefit policies to ensure they follow state and federal mandates. Compensation specialists need at least a bachelor's degree, though most obtain a master's and additional industry certification. HR managers oversee a team of professionals who design, coordinate, and implement administrative plans to ensure their company grows while remaining sustainable. These managers also serve as a link between employees and management, handling staff training and assessment. A master's degree, attendant leadership skills, and substantial work experience are required for this career. These professionals manage staff, assess job performance, and create training programs that motivate and enhance employee effectiveness. Training and development managers design every part of a program, from the instructional materials to learner participation strategies. As with most management positions, a master's degree and years of field experience is required. Working in educational settings, instructional coordinators develop curricula and maintain teaching standards and student outcomes in accordance with government regulations. They also analyze student test data to assess the effectiveness of a school's performance, and recommend changes as necessary. These professionals usually hold a master's degree and possess work experience in teaching, school administration, and other related fields. Some states may require instructional coordinators to become licensed. These training and development specialists work in diverse settings, including schools, community centers, and private corporations. They provide career guidance and help individuals obtain the academic, social, and professional skills needed to pursue their goals. Nearly all states require public school counselors to earn a master's degree and professional certification. In addition to pursuing an online training and development master's degree, students and recent graduates should consider participating in a professional organization to gain additional resources and career support. Most organizations require a yearly membership fee in exchange for access to academic scholarships, career resources, research grants, and training and certification opportunities. Professional organizations also facilitate networking events between their members and industry leaders to cultivate shared knowledge and a sense of camaraderie. Founded in 1913, AMA stands as one of the leading training organizations in the world. The association offers memberships for professionals and students, with access to training programs and specific resources like the Women's Leadership Center. ATD members live in 120 countries and enjoy a wide variety of training programs and professional development resources, including online and self-paced classes. They can also take advantage of a job board and discounts on conferences. A professional organization for career counselors, the NCDA advocates for industry rights through policy initiatives and educational programming. The association also provides ample training opportunities through webinars, in-person sessions, and professional certifications. NCWE improves job development and basic skills education within institutions of higher education. The council facilitates annual conferences and advocates for student rights at the federal level. Members can access resources like research reports, workshops, and an extensive job board. As one of the largest organizations for HR professionals, SHRM certifies schools and individuals through their accreditation program. Members receive eLearning and training opportunities, as well as career guides and job placement assistance. SHRM also offers student academic support and scholarships. While it's important to search for online training and development master's degree programs that match your interests and career goals, you should also prioritize price and financial aid opportunities when looking at prospective schools. The Free Application for Federal Student Aid (FAFSA) is the first step to accessing numerous loans, scholarships, grants, and work-study awards. Beyond federal and state funding, look for scholarships through community and professional organizations, like the Susan R. Meisinger Fellowship for Graduate Study in Human Resource or this award from the Northeast Human Resource Association.